The waves of time were eroding WWE’s familiar image away, aggressively eating away the dunes of chic and hip. Beneath the devoured sands were levels of desperation that, now unearthed, would only serve to further deface a once-effulgent company. 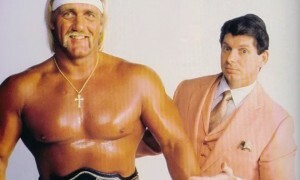 After WWE split into two brands, Raw and Smackdown, in the spring of 2002, fans used to edgy television were now being force-fed the notion that Hulk Hogan was still hip in the 21st century, and that the Stamford-approved version of the New World Order was as potent as it was when Kevin Nash and company ran roughshod over Atlanta six years prior. With WWE fans, having been conditioned to accept a younger, fast-paced centrum from WWE’s brain trust, were suddenly staring down a slower, intelligence-insulting WWE that also featured, among other things, a watered-down, unhappy Steve Austin (soon to walk out, and then be accused of spousal abuse), a slower Triple H, a midcard with little chance of advancement, and the addition of a largely-unasked-for Eric Bischoff. With ratings declining in the summer months, WWE put its Undisputed World Championship around the waist of new sensation Brock Lesnar, a frightening grappler with amateur credentials and no professional ceiling. Despite the infusion of other new talents (John Cena, Randy Orton, and Batista), WWE sunk to unseen depths, trying to lure in audiences with gay weddings, lesbian decadence, and the act of necrophilia. By the time WrestleMania season rolled around, WWE was far removed from its trendy nucleus of just two years prior. The biggest show of the year would feature, in major roles, Kurt Angle (in dire need of neck surgery), Stone Cold Steve Austin (on his last legs as an active wrestler), The Rock (returning to Hollywood), and Brock Lesnar (main eventing at his first ‘Mania). Could WWE pull this off? The actual main event of the show was Kurt Angle defending the WWE Championship against Brock Lesnar. Angle had used Lesnar to help him regain the strap at Armageddon in December from Big Show, and then reneged on giving him a promised shot. Brock Lesnar would then enter the 2003 Royal Rumble and toss out the Undertaker for the win. For the next two months, Angle’s new lackeys, WWE Tag Team Champions Charlie Haas and Shelton Benjamin, as well as Lesnar’s ex-agent Paul Heyman, would serve as roadblocks and spike strips to try and slow down the monster Lesnar as he fought to regain the title he felt he never lost. In the other main championship match, Triple H would be defending the World Heavyweight Championship on Raw against Booker T. Booker had won a battle royal one month prior to earn the shot, last ousting The Rock. However, the angle took a rather controversial turn when Triple H accused Booker of being “too much of an entertainer” to be champion, and that Booker’s “kind” weren’t good enough to hold top honors. As a matter of fact, “The Game” asked Booker to “dance” for him. All of these remarks had faint racial implications, and cast a cloud of unnecessary shock to the storyline. Triple H also brought to light Booker T’s criminal past, including his arrest and incarceration for robbing a Wendy’s in the 1980’s. Booker was given very little heroic momentum in what was a peculiar build-up. Speaking of peculiar, Hulk Hogan returned to WWE in January, after a five month hiatus, and immediately entered into a feud with Vince McMahon. McMahon claimed that bad blood had been brewing between the two men for years (even referencing his own 1994 steroid trial, in which Hogan had testified against him), and the two agreed to face off at WrestleMania XIX, in a match hailed as “twenty years in the making”. The bizarre feud would even net the participants as the lone faces on the event’s DVD packaging, in a somewhat common case of McMahon’s ego superseding the needs of his company. Stone Cold Steve Austin had returned to WWE in February, and was immediately pitted against old friend/rival The Rock. Rock had fully embraced Hollywood conceit, and was rubbing his new lifestyle into the faces of the fans who built him up, and then began booing him. Austin’s involvement seemed to be minor, as real life neck injuries were hindering one of the greatest stars in WWE history. In a match designed to capture the imaginations of fans who love being dazzled, Shawn Michaels would compete at his first WrestleMania in five years to face Chris Jericho. Jericho had claimed to have idolized Michaels, and was now ready to surpass a man whose standard Jericho now felt he was above. Y2J would go as far as to admit Michaels’ influence on his career, and indicated that evolution would take place on wrestling’s grandest stage. Jim Ross and Jerry Lawler would call the Raw brand matches, while Michael Cole and Tazz covered the ones from Smackdown. Ashanti performed “America the Beautiful”, Limp Bizkit performed a pair of songs (including “Rollin” for the Undertaker’s entrance), and Miller Lite models Kitana Baker and Tanya Ballinger recreated their famed catfight commercial on the entrance set. WrestleMania XIX was a mirage in the desert that was WWE in 2003. The drastic changes in Vince McMahon’s cash cow going into 2003 were rather alarming. Once a self-assured, well-booked company was now a mostly depressing product, centered around developmental stars that made no head way (Three Minute Warning, Chris Nowinski, and Batista (yet, anyway), as well as stars that the fans loved, but got no love from WWE (Booker T, Rob Van Dam, Dudley Boyz, etc). While WrestleMania was one of only two exceptionally good pay per views in 2003 (the other being Vengeance in July), the show simply felt out of place, not quite fitting of the “grandest show of the year” title that is bestowed on it. The last four matches filled out the marquee. Two of them featured wrestlers who were hospitalized the night before the show (Angle and Austin), one with tasteless racial overtones (HHH-Booker), and one between two men in their middle age, fighting for fictitiously-contrived reasons, trying to sell the show on little-known “real life” drama, as opposed to a compelling angle. The in-ring action was more than enough to save WrestleMania XIX, dragging the horrid build out of the self-made muck. To do that, he brought in the original three members of the New World Order: Scott Hall, Kevin Nash, and Hollywood Hulk Hogan.